ST. IGNATIUS – The gravelly sound of wheels crunching on the bowl walls and tails scraping on the concrete filled the Skate Ignatius skate park Sunday as skateboarders from across Western Montana came to hang out and show off their skills during the Board of Missoula hosted Skate Jam. 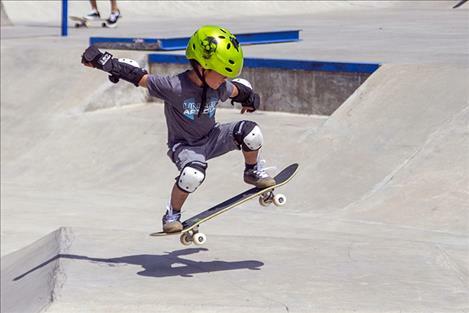 Although skaters had to wait a day to shred due to a rain cancellation on Saturday, event organizers were pleased with the turnout of roughly 40 skaters. Skate Ignatius skate park was constructed and opened in 2010 to give area youth a positive outlet and provide them a place to go where they feel like they belong. Dreamland designed the 10,000-square foot park with elements skaters might find on a city street to ply their tricks on like stairs, railings, park benches, short walls, and planters. The all-ages event had no charge for admission and no entry fee for the competitors. It was an event for everyone and anyone who could come up with a board. Music maintained the energy, free hotdogs and drinks kept the stomachs full and random free prizes and merchandise giveaways which included skateboards, shirts, and hats made the skaters happy. Throughout the day, groups of skaters waited in line to take turns dropping off the ledge of the quarterpipe to practice grinds, while other skaters concentrated on perfecting tricks using the rail and ledges. Still others practiced curving their boards through the park’s obstacles riding from one ramp to the next doing some jumps.